In today’s Dev Letter, we’re talking about a brand new way to track your progress and show off your skill in PUBG. A Rank System has been a highly requested feature for some time now and we’re excited to finally be kicking off the first beta season. With it, we hope players will be able to better see their own growth, while being able to see where they stand among the millions of PUBG players out there, no matter which way they choose to enjoy the game. And best of all, once beta is over and we start real seasons, we’re planning some great end-of-season rewards surrounding this system. For now, let’s talk about the system itself. The PUBG Rank System gives players another way to show off their skills as a survivor. You’ll begin each new season by playing 10 placement matches to determine your initial rank. From there, each game you play will adjust your Rank Point total, which determines your overall Rank. For the beta, we’re targeting about a 2 month season as a test window and will take a look at how that feels once it’s complete. Rank Points are accumulated by simply playing and performing well in games. Kills and overall placement both contribute to these points with a higher amount awarded based on how well you do. The rank tier you’re in and number of players in your game are also taken into consideration to calculate your final RP earned for that game. RP can be lost as well, so consistency is the key to achieving the next Rank. Each of the 8 Ranks represents a range of total RP earned throughout the current season. At the start of a new season, RP will be soft reset and you will enter placement matches once again to determine your new starting rank, which takes into account your final standing from the previous season. Ranks will be gained and lost as you cross their point thresholds, with no additional qualifying matches required to move to the next rank. These tiers are also separated by queue type, meaning that you will have a different Rank in Solo, Duo, and Squad queues which are also separated by FPP and TPP. 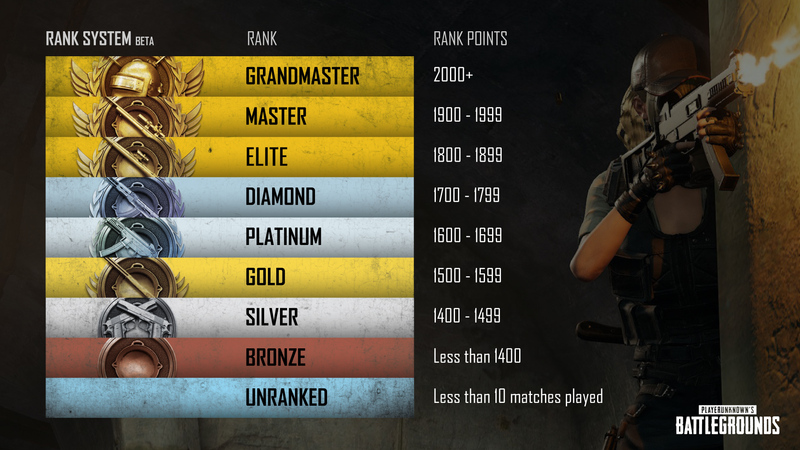 We want everyone who loves PUBG to be able to experience the new Rank System without being forced into a specific way to play, so the choice is yours whether you focus on one or all of the different queues! And for even more prestige, each queue will have a Top 100 leaderboard, showcasing the best of the best players in each game mode. This leaderboard is global, so showing up on here means you’ve clawed your way through some of the best players PUBG has to offer. Good luck! With the introduction of Ranks, we also want to clarify how matchmaking is handled. There is still a separate MMR that is calculated based on your overall performance in games. This overall MMR will determine who enters matches with you and does not take into account your Rank or Rank Point total. Due to the sheer amount of players needed for each game, the matchmaking pool needs to be a little more open than simply adhering to Rank like a game with only 10 people per match could, while also helping with overall queue times. However, as you achieve higher ranks, many of the same performance factors are going into how many RP you’re earning, so in many cases high ranks will be matched with each other regardless. We’ve also updated how regions work in general, so that the server closest to you will automatically be preferred when the matching pool in that region is sufficient. If that matching pool doesn’t have sufficient players, the next closest server will be chosen. 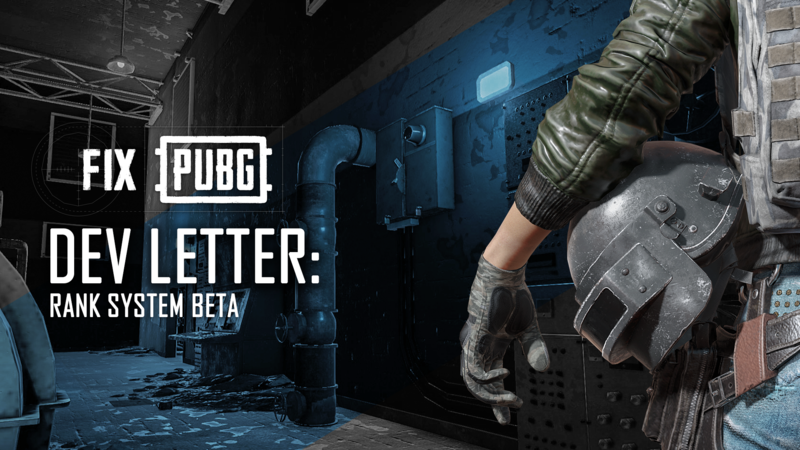 We’re excited to kick off the first PUBG ranked season beta with Update 22, and hope our players enjoy the added prestige that comes with your shiny new Rank medal. We’re looking forward to your feedback on the system, so hop in game, knock out those placements, and show the world what you’re made of!